In the 1960s there were observations that there existed stellar objects that emitted radio waves which were thought to be stars that had unusual optical spectra. With the optics available at the time, quasars looked like single points of light indistinguishable from faint stars. Finally it was recognized that the spectra lines had large Doppler shifts suggesting velocities that were fractions of the speed of light. These objects were obviously not ordinary stars and were named "Quasi-stellar Radio Sources", meaning "star-like radio sources", which was soon abbreviated to "quasars". At the left is a NASA artist's concept of a quasar. Active Galactic Nucleus (AGN) galaxies all have a very powerful energy source much bigger than what ordinary stars produce (including supernovas and neutron stars) coming from a small area in the center of their galaxies. These quasars are now recognized as super massive black holes at the center of emerging galaxies "back in the early universe". The quasar is believed to be powered by the accretion disc around the centralized black hole. Note that the quasar's radiation comes from the edge of the accretion disc, rather than from the accretion disk's center, which is also the center of the black hole. Most quasar radiation exceeds the luminous output of average size galaxies. However, they appear star-like in ordinary telescopic photographs because the light from their nucleus dominates the light from the surrounding galaxy. Quasars are the most luminous, powerful, and energetic objects in the universe. They inhabit the centers of active very young galaxies and emit up to a thousand times the energy output of our whole Milky Way and two trillion times the energy of our sun. Most quasars have a very high redshift (the measurement of the stretching of light to the red end of the spectrum by the expansion of the universe). The implication of the large redshift is that quasars are very distant, meaning they are objects from much earlier in the universe's history. 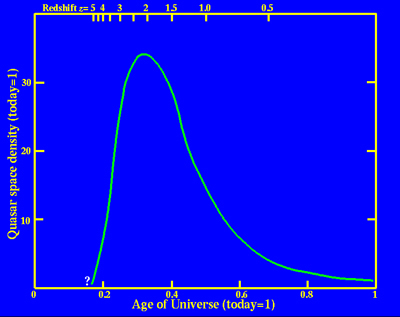 Most were born when the universe was less than 5 billion years old, at a redshift of 1.0 or more. Quasars are about the same size as our Solar System (i.e. relatively small). This implies a humongous energy density. To create a luminosity of 10^40 watts, the typical brightness of a quasar, a super-massive black hole would have to consume the material equivalent of 10 stars per year. 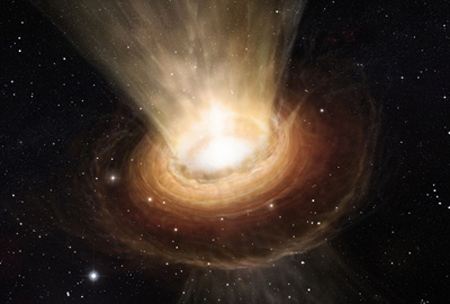 The brightest known quasars devour 1,000 solar masses every year. 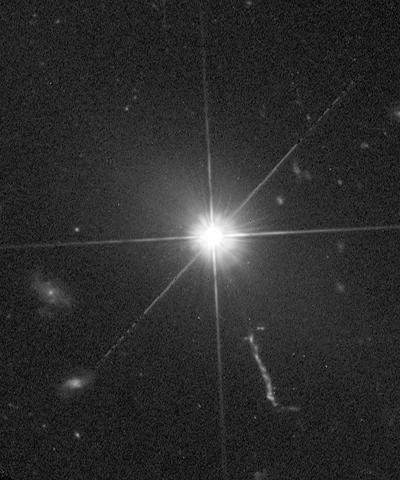 Shown at the left and also the jet directly below is the first (and brightest) quasar visible from earth - 3c273. Galaxy 3c273 is located in the Orion Constellation, but is about 2.4 billion light years away (redshift = 0.158), actually quite close by celestial standards. Since light cannot escape the super massive black holes that are at the center of quasars, the escaping light is actually generated outside the event horizon of the black hole by extreme twisting magnetic forces and the immense friction of incoming material. Most of the material falling into the central black hole's gravity field is unlikely to fall directly into the black hole, but rather into the accretion disk surrounding the black hole. The falling matter will have some angular momentum of its own that will add to the angular momentum of the accretion disc so that total angular momentum is conserved. Several dozen nearby large galaxies have been shown to contain a central black hole in their nuclei with no sign of a quasar nucleus. It is thought that all large galaxies have a super-massive black hole at their center, but only a small fraction emit powerful radiation and are seen as quasars. Many scientists contend that most supermassive black holes today were once quasars in the early universe. As the quasars fuel was depleted they become the supermassive black holes that we observe today. Some become almost dormant for lack of fuel, for example: the black hole in the center of the Milky Way. Scientists believe quasars may be re-ignited from dormant galaxies if they ingest a fresh source of gas or other matter. The spectra of quasars are quite different from those of ordinary galaxies showing broad emission lines of gas excited to high levels. They also exhibit a blue continuous spectrum lacking the absorption lines from ordinary stars. The beams of radiation from material moving close to the speed of light indicates that the jet's light has been boosted such that it overwhelms everything else. The diagram at the left was published by Bill Keel, Professor Of Physics and Astronomy at the University Of Alabama. The scale on the bottom of the chart is time, but it can also be redshift as shown at the top of the chart. Looking at very distant objects in the universe is equivalent to looking back in time because of the constant speed of light in a vacuum. The number of quasars peaks at a redshift of about 2.25, when the universe was about 3 billion years old. The oldest quasar from the Sloan Digital Sky Survey (SDSS) is one with a redshift of 6.4 which was about 800,000 years after the Big Bang. At a redshift of about 4.0 there was a rapid increase of quasars. About this time early galaxies formed, collected enough material to make a fairly massive black hole, and had enough massive stars in its immediate neighborhood to devour and produce the heavy elements seen in quasar spectra. The first stars, forming from pure hydrogen and helium, were quite different from the ones we see today. The first stars were very massive and hot, exploding with more violence than today's supernovae. These stars, with masses hundreds of times larger than our sun, would have scattered their make up of heavier elements very widely as each exploded. These explosions would have destroyed the surrounding gas clouds and forced galaxy formation to start over. 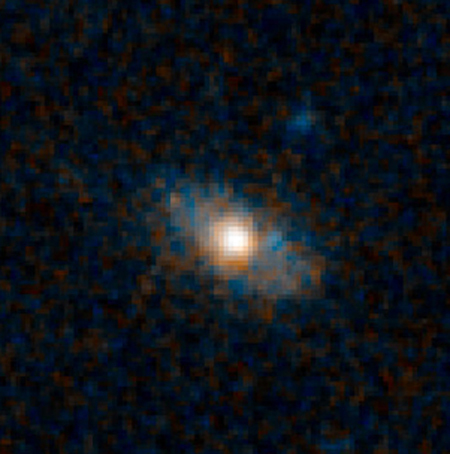 Quasars, the brightest objects in the universe, can be used as research tools to study objects in the distant universe through gravitational lensing and other techniques. One of the successes of Einstein's general theory of relativity was the prediction of the "bending of light" by a massive object (such as the sun). See the Gravitational Lensing section. The light from a distant quasar can also find itself bent by the curvature of space-time when passing around massive objects such as galaxies or clusters of galaxies. Mass that bends quasar light can be normal mass or dark matter (a better name would be transparent matter). 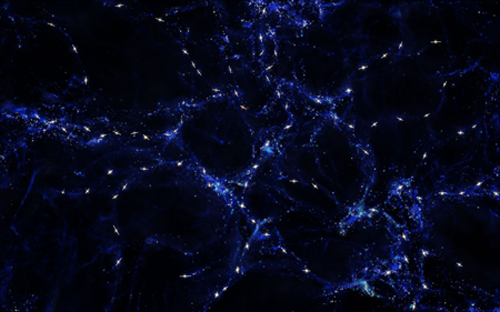 A significant "proof" of dark matter comes from carefully plotting the way that light from distant images, such as quasars, is distorted by galaxies. Using this technique, it is possible to quite accurately map where dark matter is located and to estimate its mass. The photo to the left shows two images of a distant quasar (0957+561 in Ursa Major) also from a paper by Bill Keel. Only the top image is a real quasar. 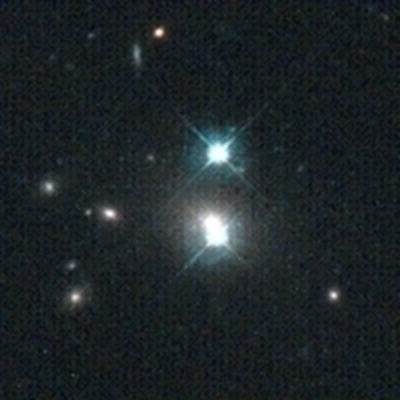 The bottom one is formed by gravitational lensing and is a false image. Astronomers can tell that both images are from the same quasar because both have identical spectra. Q0957, discovered in 1979, was the first quasar observed to have gravitational lensing. So far there have been about 50 more quasars discovered that exhibit gravitational lensing. 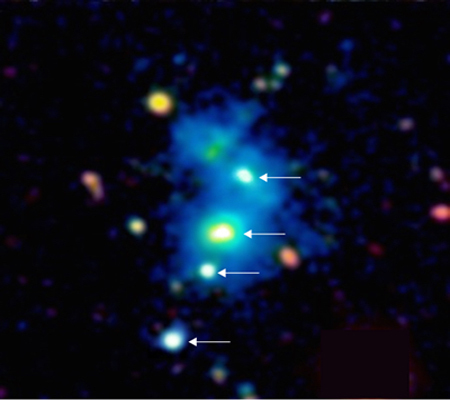 Using the Nuclear Spectroscopic Telescope Array (NuSTAR) and the European Space Agency's (ESA's) XMM-Newton, researchers were able to use the x-ray spectra of an extremely luminous quasar, PDS 456, located more than 2 billion light years away, to detect a nearly "spherical" stream of highly ionized gas streaming out of it. This discovery allowed astronomers to measure, for the first time, the strength of ultra-fast black hole winds and show that they are strong enough to affect their host galaxies. 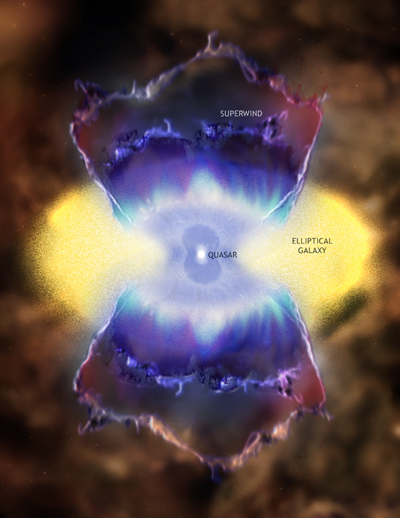 The NASA artist's illustration, to the left, depicts the powerful winds driven by the supermassive black hole quasar PDS 456 (only one side is shown in the artist's impression). matter, and this process can produce winds. This is thought to regulate the growth of the galaxies," said Fiona Harrison of Caltech, the principal investigator of NuSTAR and a coauthor of the paper documenting the results in the February, 2015 issue of Science. 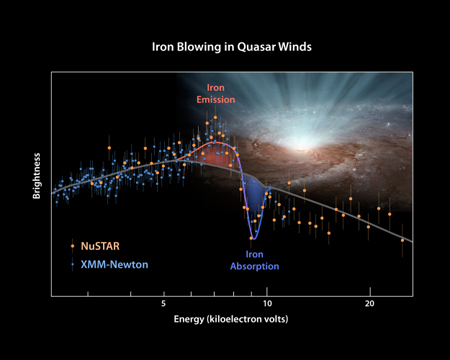 "Now we know quasar winds significantly contribute to mass loss in a galaxy, driving out its supply of gas, which is fuel for star formation," said the study’s lead author Emanuele Nardini of Keele U. in England. Supermassive black holes blast matter into their host galaxies, including x-ray emitting winds traveling up to one-third the speed of light. In this new study, astronomers determined that PDS 456 has winds that carry more energy every second than the amount emitted by one trillion suns. It seems most likely that both a SMBH and the galactic bulge of its host galaxy grow in tandem and regulate each others growth. The plot of x-ray data, to the left, from NASA's NuSTAR and ESA's XMM-Newton determined for the first time the shape of ultra-fast winds from the SMBH quasar PDS 456. The winds blow in every direction in a nearly spherical fashion from both sides of the quasar. XMM-Newton sees lower-energy x-rays (blue dots), and NuSTAR sees the higher ones (yellow dots). The pink hump represents winds blowing away from the SMBH, while the blue dip are winds blowing towards the satellites. Black holes in the early universe needed a few snacks rather than one giant meal to fuel their quasars and help them grow, according to observations from NASA's Spitzer and Hubble space telescopes. See the image to the left of a typical dusty quasar. A census of 30 quasar host galaxies conducted by two of NASA's observatories, Hubble and Spitzer, found that 26 of the host galaxies showed no telltale signs of collisions with neighbors, such as distorted shapes. Only one galaxy in the sample showed evidence of an interaction with another galaxy. The galaxies existed roughly 8 billion to 12 billion years ago, during a peak epoch of black hole growth. The study, led by Kevin Schawinski of Yale University, bolsters evidence that the growth of most massive black holes in the early universe was fueled by small, long term events rather than dramatic short term major mergers. 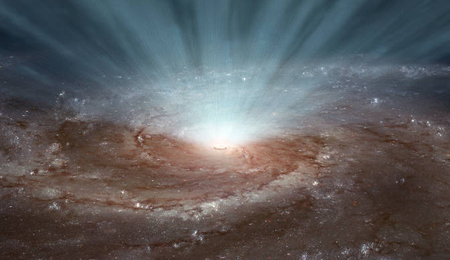 A black hole doesn't need much gas to satisfy its hunger and turn on a quasar. "The objects we looked at in this study are the more typical quasars. They're a lot less luminous. The brilliant quasars born of galaxy mergers get all the attention because they are so bright and their host galaxies are so messed up. But the typical bread and butter quasars are actually where most of the black hole growth is happening. They are the norm, and they don't need the drama of a collision to shine" Schawinski said. The discovery of monster quasar, SDSS J0100+2802, is an important step in understanding how quasars, the most powerful objects in the universe, had evolved only 900 million years after the Big Bang. The international team led by astronomers from the University of Arizona and from Peking University in China announced their findings in the scientific journal Nature in February, 2015. This huge quasar has a central black hole mass of 12 billion solar masses. It is the second most massive black hole in the universe that has been confirmed by NASA's NuSTAR (Nuclear Spectroscopic Telescope Array), an x-ray space telescope designed specifically to study black holes. (As of early 2015 black hole OJ 287 had been confirmed at 18 billion solar masses). With a luminosity of 420 trillion suns, quasar SDSS J0100+2802 is the brightest quasar ever discovered. It is seven times brighter than the next most distant known quasar. 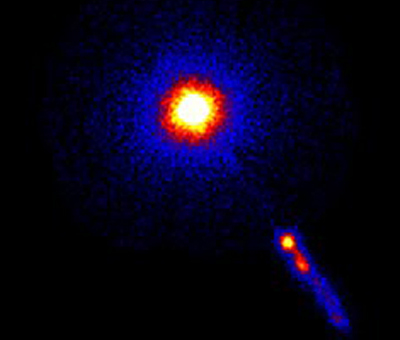 The quasar was found after astronomers selected the quasar from the Sloan Digital Sky Survey (SDSS) of over 500 million objects in the northern skies because of its distinctive red color. They then followed up with three other telescopes to study the object in detail. It has a redshift of 6.30, making it a very old and distant object about 13.0 billion light-years from earth. Astronomers have uncovered quasars dating as far back as about 700 million years (redshift 6.5) after the Big Bang. Despite their high luminosity these distant quasars are are very difficult to find and are extremely faint to our scientific eyes because of their great distance in a dusty universe. Only 40 known quasars have a redshift higher than 6.0, the yardstick that defines the boundary of the early universe. Using the W.M. Keck Observatory in Hawaii, a group of astronomers, led by Joseph Hennawi of the Max Planck Institute for Astronomy in Heidelberg, Germany, have discovered the first quadruple quasar, i.e. four rare active black holes situated in close proximity to one another. The results were published in the May, 2015 edition of the journal Science. See the image to the left of the region of space occupied by the rare quasar quartet. The four quasars are indicated by arrows. The quasars are embedded in a giant nebula of cool dense gas visible in the image as a blue haze. The nebula has an extent of one million light-years across. These objects are so distant that their light has taken nearly 10 billion years to reach telescopes on earth. This false color image is based on observations using the Keck 10 meter telescope on the summit of Maunakea in Hawaii. The researchers estimate that the odds of discovering a quadruple quasar by chance is one in ten million. Either the discovery is a one in ten million coincidence, or cosmologists need to rethink their models of quasar evolution. Quasars are exceedingly rare and are typically separated by hundreds of millions of light years from one another, not the one million of this quasar quartet. The four quasars are surrounded by a rare giant nebula of cool dense hydrogen gas - which the astronomers have dubbed the “Jackpot Nebula”, given their surprise at discovering it around the unprecedented quadruple quasar. The nebula emits light because it is irradiated by the intense glare of the quasars. In addition, both the quartet and the surrounding nebula reside in a rare corner of the universe with a surprisingly large amount of matter. “The giant nebula is an important piece of the puzzle,” says Fabrizio Arrigoni-Battaia, a PhD student at the Max Planck Institute for Astronomy who was involved in the discovery, “since it signifies a tremendous amount of dense cool gas.” Supermassive black holes can only shine as quasars if there is enough gas for them to swallow. An environment that is super gas rich provides a favorable condition for fueling multiple quasars. A team from the University of Liège in Belgium used the VLT (Very Large Telescope in Chile) to study 93 quasars spread over billions of light-years when the universe was about one third of its current age. The data revealed quasar alignments over the largest structures in the universe. This study was published by ESO (the European Southern Observatory) in November, 2014. When astronomers look at the distribution of galaxies on scales of billions of light-years, they find that they are not evenly distributed. The galaxies form a cosmic web of filaments and clumps around huge voids where galaxies are scarce. The new VLT results indicate that some of the quasars' rotational axes are aligned with each other, despite the fact that these quasars are separated by billions of light years. They also tend to be parallel to the large scale structures in which they find themselves. So, if the quasars are in a long filament, then the spins of the central black holes will align with the long filament. Researchers estimate that the probability of these unique alignments are simply the result of chance is less than 1%. The team could not see the rotation axes or the jets of the quasars directly. Instead they measured the polarization of the light from each quasar and found a significantly polarized signal. The direction of this polarization, combined with other information, could be used to deduce the angle of the accretion disc and hence the direction of the spin axis of the quasar. A correlation between the orientation of quasars and the structure they belong to is an important prediction of current computer models of the formation of the universe. This data provides the first "observational confirmation" of this correlation on scales much larger than had been expected.